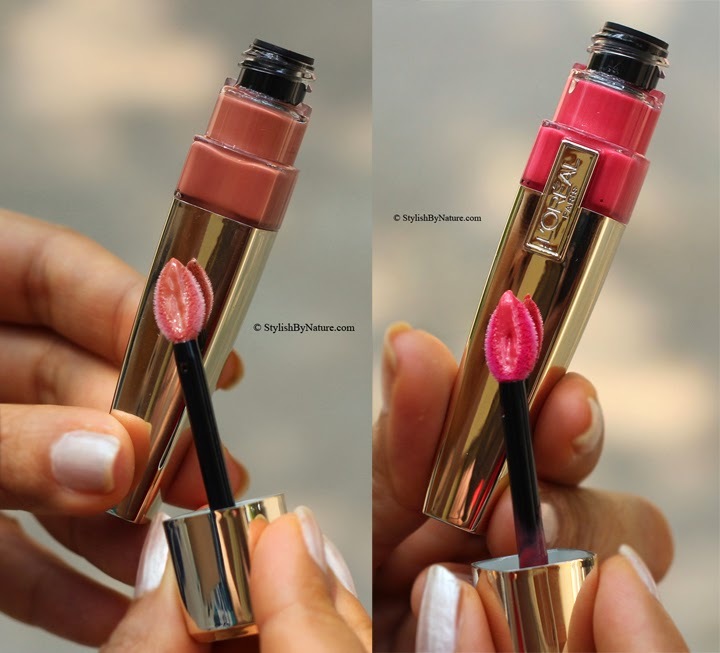 L'Oreal Paris is always my go to brand for lipsticks and I was quite looking forward to launch of their Shine Caresse range. So, here are my warriors from L’Oreal Paris Shine Caresse range which won me over for the packaging and colors at first glance. Now hydration & shine meet lasting, lightweight color. With Shine Caresse, discover a lip gloss that doubles up as a lip stain. This next generation lip colour combines the texture & shine of a gloss with the long-wear ability of a stain. It delivers a lasting colour with a subtle glossy shine. L'Oreal Paris presents the next generation lip colour, that combines the texture and shine of a gloss with the long wear of a stain. Dazzling shine, Fresh moisture, lightweight lip color. The first lip colour to fuse with your lips. Rich, refined lips yet a barely-there lip sensation. Lips feel cocooned in a fresh, dewy sensation. The modern way to play your lip colour. The unique formula comprised of 30% water and 60% oil provides an exceptionally high level of moisture, allowing for 6-hour hydration. Concentrated soluble colour pigments create a subtle wet look with a weightless feeling on lips. Aqua, water, octadodecanol, Dimethicone, ethyl cellulose, phenoxyethanol, hydroxypropyl Guar, Alumina, Silica, Linalool, Calcium aluminum borosilicate, benzyl alcohol, Sucrose cocoate, SLS, Hydroxy citronellal, Citronellol, Benzyl alcohol, Parfum/Fragrance. L'Oreal Paris Shine Caresse lip gloss has a unique formula that provides an exceptionally high level of moisture and allows 6 hour hydration. Concentrated soluble color pigments create a subtle wet look with a weightless feeling on lips. Lipgloss slides smoothly on the lips leaving a sheer thin layer on lips. Layer up to add color intensity. Best part of the gloss is it doesn't transfers easily and plumps up the lips without settling in the lip lines. Delivering a lasting color with a subtle glossy shine, L'Oreal Shine Caresse is the lip gloss you always wanted. The Rouge Caresse lipstick has a flutter of kissable, soft, colour. Its delicate texture glides onto lips creating a veil of colour with a luminous shine. It adds a desired pop of color with a meltingly soft application. It was my first time trying a L'oreal Paris Rouge Caresse Lipstick and i was thoroughly impressed. The lipstick is sooo moisturizing. It has enough color, gloss without being overwhelming. It's perfect for work. L'oreal definitely won me over with this! Love this this product. Its is so soft and creamy. My lips feel moisturized and soft throughout the day. The colors are so pretty and vibrant. So summery. I'm slowly going to buy all the shades.